Hydroelectric power is China’s largest renewable energy source and its second overall, trailing only coal. 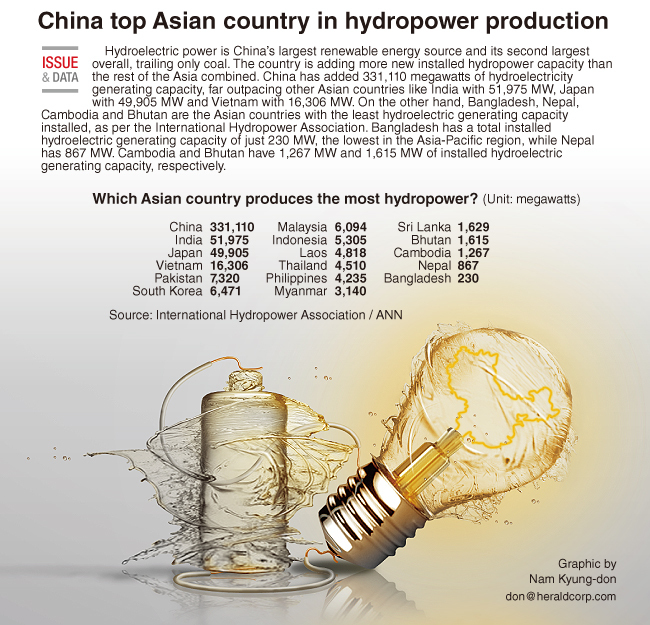 The country is adding more new installed hydropower capacity than the rest of the Asia combined. China has added 331,110 megawatts of hydroelectricity generating capacity, far outpacing other Asian countries like India with 51,975 MW, Japan with 49,905 MW and Vietnam with 16,306 MW. On the other hand, Bangladesh, Nepal, Cambodia and Bhutan are the Asian countries with the least hydroelectric generating capacity installed, as per the International Hydropower Association. Bangladesh has a total installed hydroelectric generating capacity of just 230 MW, the lowest in the Asia-Pacific region, while Nepal has 867 MW. Cambodia and Bhutan have 1,267 MW and 1,615 MW of installed hydroelectric generating capacity, respectively.